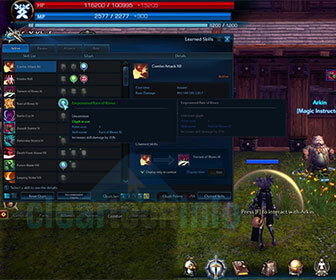 The Tera Skills and Glyph guide below is a beginner’s introduction to Tera Skills and Glyphs. As you are leveling up new skills and glyphs will be available to you as well as the addition of more glyph points. When you reach max level it may be a bit confusing when you have a lot of different glyphs available and are not sure where to allocate all of your glyph points. In these situations I recommend seeking the advice of a guildy with the same class as you that you consider to be good, at least that is what I do. 01. If you haven’t grabbed all of your available class skills from your Tactics or Magic Instructor / Trainer, do yourself a favor and do so. 02. Quick overview of combat, passive, pet, mount and alliance skills. 03. Brief explanation of glyphs, they enhance your skills. 04. How-To unlock glyphs via glyph boxes. You get them at the BG Bellicarum vendor and through two dungeons, Sabex Armory and Macellarius Catacombs. 05. When you reach level 61 with a gear item level of 160+ you can run the Sabex Armory dungeon on a daily basis. When you complete the dungeon the daily quest will give you a superior glyph box. 06. When you reach level 64 with a gear item level of 170+ you can run the Macellarius Catacombs dungeon. It will also give you a superior glyph box as a daily reward for completing it. 07. Glyph Builder / Calculator – A website where you can input a glyph setup on any class at any level. Then you can share that setup with your friends via a provided link. 08. Explanation of Glyph points, how glyph points accumulate and the maximum amount of glyph points available at max level. If you have any QUESTIONS or COMMENTS about this Tera Tutorial / Video Guide on Glyphs and Skills Beginner’s Run-Through or have other questions relating to Tera, feel free to ASK FOR HELP BELOW!